When Maria was in college she gained almost 40 pounds trying to out-eat most of her dude friends (dude friends are always dangerous, by the way) and now she keeps fit with a sane workout schedule and healthy eating habits. Maria has a new book out called The Everygirl’s Guide to Diet and Fitness and you can catch her in full “band workout” mode inside the magazine. 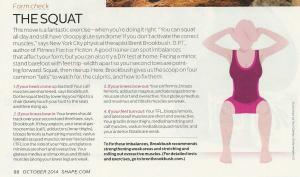 What else is in this issue of Shape? As a trainer I can tell you that if there is one move we observe to check out the fitness level of a potential client—it’s the squat. I really loved this description on what to look for in a proper squat by Brent Brookbush, D.P.T. October is Breast Cancer Awareness month but you should be shopping for cute pink things all year round. 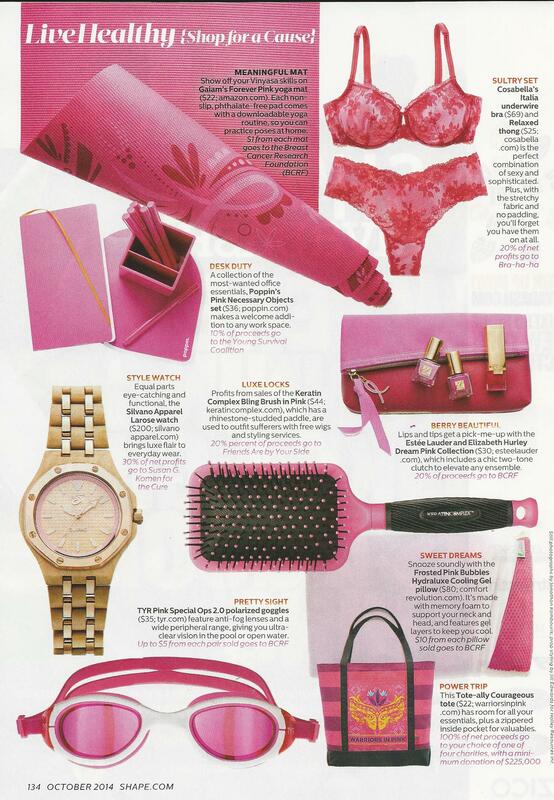 This page features items that will support breast cancer charities. The best lotions, potions and fun hair care things to keep you looking gorgeous. 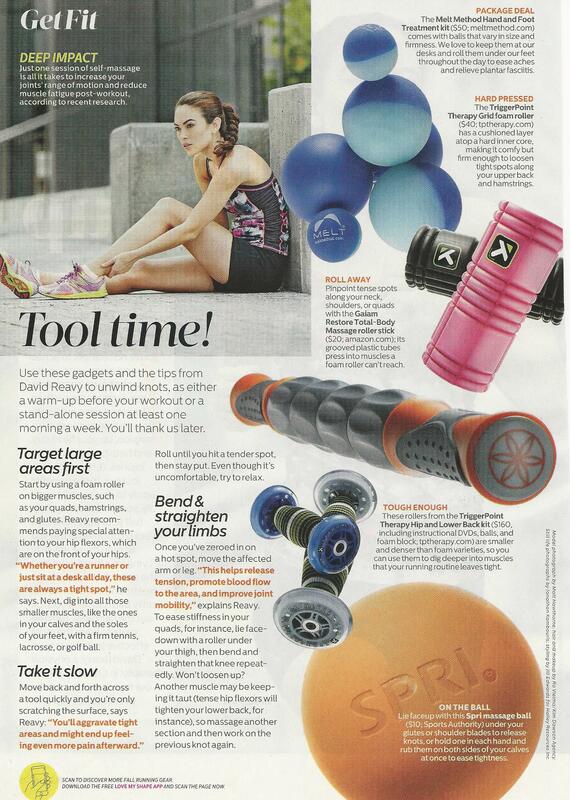 If you are like me—you need to foam roll constantly to help out the knots in your back and tight IT bands. Shape has the best products on the market to do just that. 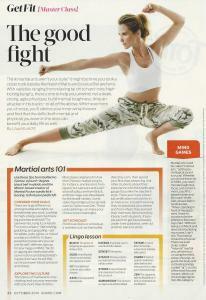 One of the best ways to get healthy and learn self-defense is to learn martial arts. 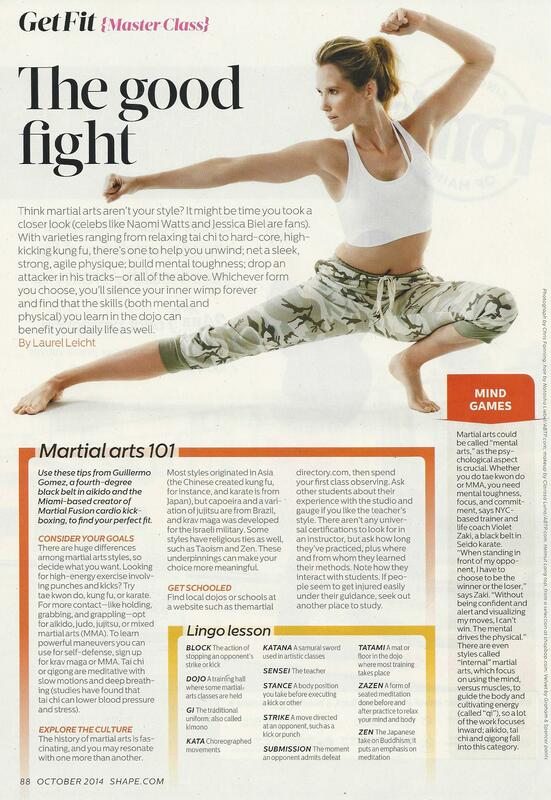 Here we get “Martial Arts 101” and a “Lingo Lesson” from Guillermo Gomez creator of the Martial Fusion workouts. Lashaun Dale of Equinox gyms teaches a yoga class called “Flow Play” which is a Vinyasa workout with a carefully selected playlist. “Step Right Up” Incorporating stairs and bleachers can help ramp up your workout according to Paul Juris of the Cybex Research Institute. A I was happy with the workouts featured and the shopping pages were cute and useful. This entry was posted in Uncategorized and tagged "Flow Play", Brent Brookbush, Brooklyn Fit Chick, Cybex Research Institute, Equinox, exercise, fitness, Guillermo Gomez, Lashaun Sale, Lisa Kinder, Maria Menounos, Martial Fusion, Paul Juris, Shape magazine, workout by brooklynfitchick. Bookmark the permalink. Thanks for showing those yoga moves. I’ve recently got into yoga and it’s doing some great things for my body.